Matthews, Jane - With heavy hearts we announce the passing of our wonderful mum, Jane Matthews (nee Brazendale) on Saturday morning, April 6 in her 100th year. Mum joins her loving husband of 60 years, George who passed away in Florida in 2001. She will be sadly missed by her sons John (Izzie) of Midland and Ray of Welland, her grandchildren Damien, Deirdre (James), Julie (Darren) and Ryan and great grandchildren Edie and Leni. 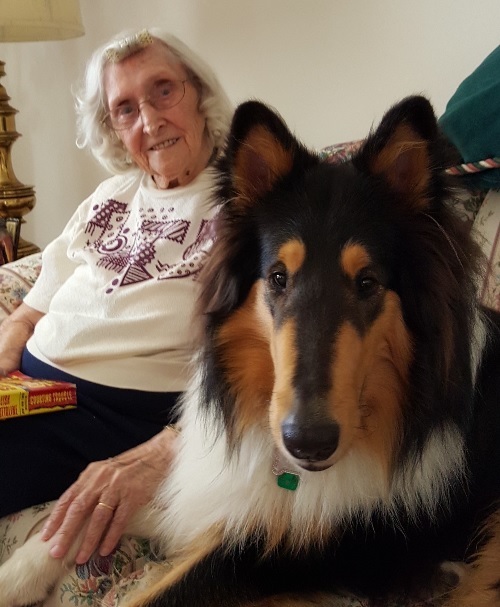 She will also be missed by her special friends and caregivers Judy, Linda and Susan who helped her stay in her own home and her canine buddies Lloyd and Kingsley who will miss the treats liberally handed out at Granny's house. Special thanks to the staff at the Woolcott Wing for their sensitivity and care during the final weeks of mum's life. Mum dedicated her life to her family and was an expert in the homemaker's arts: Cooking, baking, knitting and sewing and generally binding up wounds both physical and psychological all came naturally to her. She was a wonderful storyteller, entertaining us with stories about her childhood in Liverpool, England: Her pet monkey that used to jump on the back of dogs and ride them down the street and her parrot that dropped seeds on her grandad's head and cackled with glee. She especially liked to tell us about her experiences during the war. Always with humour, she would describe near misses during the blitz, working in an armaments factory, rationing and even meeting the King and Queen. She always maintained that she saw more of the war at home in Liverpool than our father did away in the navy. After the war the family emigrated to Canada (Windsor) and in 1994 mum and dad moved to Welland to be closer to their grandchildren. Mum enjoyed a long and eventful life, but she still left us too soon. Friends and neighbours are invited to a celebration of mum's life at her home, 101 Walts Street in Welland on Sunday, April 14 from 1 pm. Online condolences available at www.cudneyfuneralhome.com .